Webster says that codification is the arrangement of laws systematically. A municipal code is an organization of local legislation by subject matter, from the general to the specific. Codification was historically a printing press industry, which simply printed old words on new pages. The industry standard is now focused on local government consulting. The insightful codification firm recognizes that the municipal attorney is very busy, and offers assistance with the content, not just the printed page. The firm acts as a quasi-assistant to the municipal attorney, performing routine cite checks, editing checks and comparisons to state and federal law. Compilation is the organizing of existing ordinances, usually by subject matter, and then placing the ordinances in chronological order within each subject. Compilation is the first step in codification. Codification finishes the job. Codifying includes removing repealed or obsolete ordinances and editing for proper grammar, consistency and clarity. Codifying also encompasses formatting the material into user-friendly titles, chapters and sections, and supplementing with new ordinances. The result is one body of current, enforceable law. Municipal employees can function more efficiently with the current law between two covers, organized, indexed and at their finger tips. The public must have access to the law in order to determine the standard of conduct required. All current ordinances on a given subject are contained in one portion of the code, such as a chapter or section. The administration of the regulations and the penalties are set out clearly within that portion of the code. Furthermore, codification is a method of good government. With the erosion of sovereign immunity, municipalities are now facing multitudes of civil rights lawsuits. It is more important than ever that the municipality have up-to-date, clearly written, accessible laws. 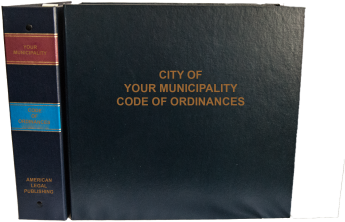 Codification helps to deter the municipal legislative body from enacting redundant or inconsistent new ordinances, and lets the council or board view the body of law as a whole and note any gaps in coverage which may need legislation.